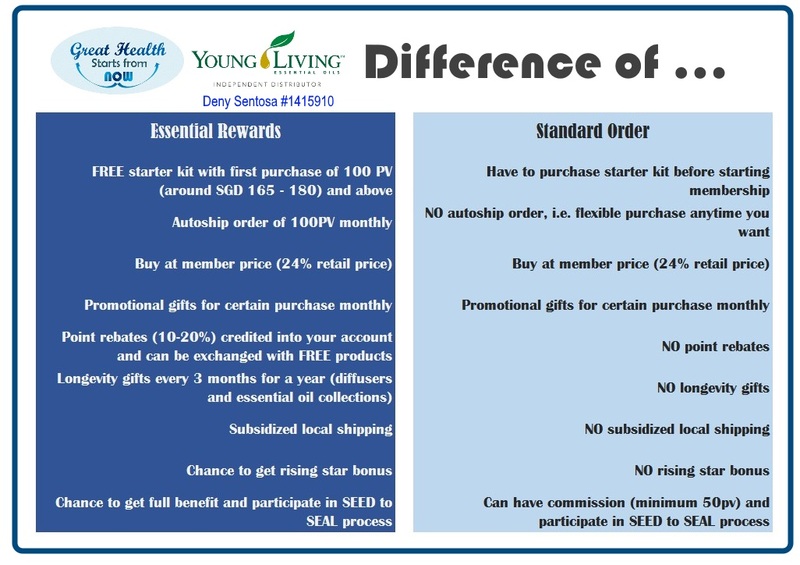 You are ready to purchase Young Living products, but how come there is membership involved? What kinds of membership YL provides. 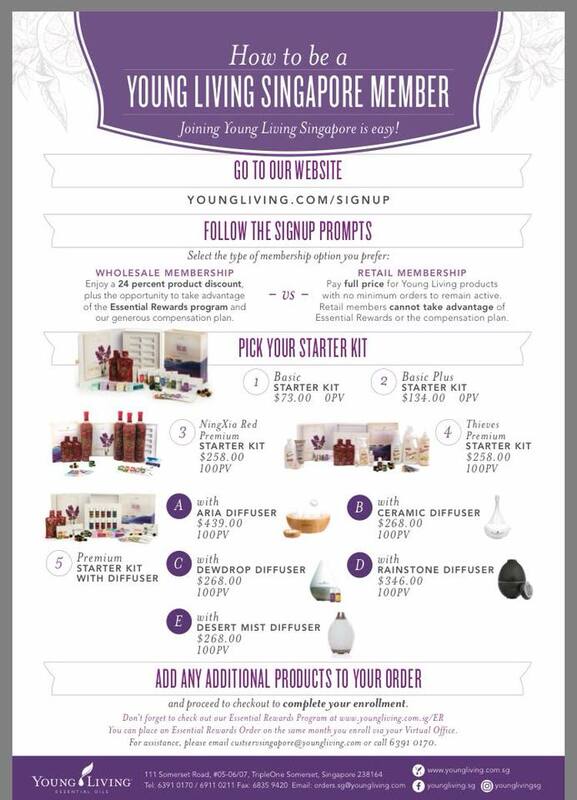 In this article, I will explain about types of the most common memberships in Young Living. Monthly order membership (Essential Rewards) with minimum 100 PV purchase each month. In Singapore dollars, 1 PV equals toapproximately S$1.68. The membership comes with benefit as illustrated in the next picture. You can terminate this membership anytime with no penalty fee. An on-and-off-purchase membership (Standard Order) with no minimum purchase each month. Members only need to purchase 50 PV per YEAR. 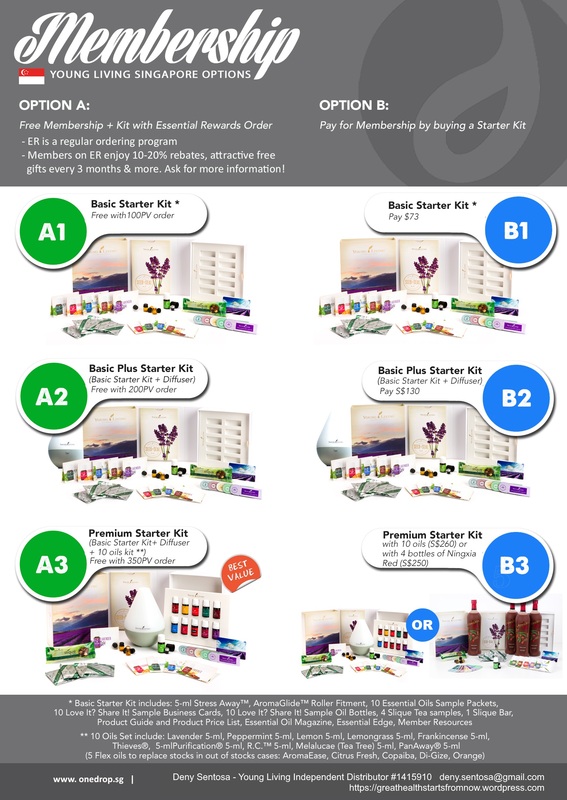 Members are required to purchase starter kit at the beginning (see picture on the left). It applies INTERNATIONALLY. Members can purchase and redeem from countries other than the registered membership. Membership can be renewed with just 50PV purchase/year (essential rewards members don’t need to worry about this). Every member can be enroller or sponsor for other members even though they reside in difference countries. You can contact me for further info at my email deny.sentosa@gmail.com if you need details on the membership or memberships from other countries. For your information, YL Indonesia office will open on March 201! So folks in Indonesia can temporarily use the forwarder to ship YL products from Singapore to Indonesia at a small fee. Don’t hesitate to contact me for further info if you are in Indonesia and interested in ordering. Or if you are ready to be member, click here.